Join us on International Women’s Day for a President’s Leadership Lecture Series featuring a panel of three inspiring women and their stories, with the united theme of Deconstructing Gender and Race. 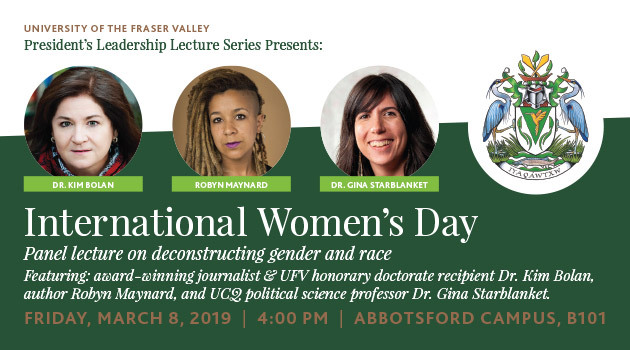 Award-winning journalist and 2018 UFV Honorary Doctorate recipient Dr. Kim Bolan, award-winning author Robyn Maynard, and Indigenous political science professor Dr. Gina Starblanket will share their personal experiences that have led them to where they are now. A student political science gender display and refreshments will precede the lecture just outside of the lecture hall from 2-4pm.